Where Are We With the Use of Scorpion Venom to Cure Cancer? During our years in practice we’ve encountered numerous patients with metastatic breast cancer who were using scorpion venom as a form of treatment. Some have used it in combination with chemotherapy and others without any conventional treatment. The cost was around $1000 per treatment, but it was used by our patients regardless of the high price.A� Did it work? Hard to say, especially in patients who used it in combination with chemotherapy. Was it the scorpion venom or the chemotherapy that killed the cancer? But here’s what we found out about the use of scorpion venom in treating cancer. When we are talking about venom, this is a toxin that is secreted by animals, such as scorpions, as a defense mechanism. Venom is poisonous; however, when there is a controlled intake, the normal cells may be ignored while the cancer cells may be affected. There are various types of scorpions: Chinese Golden Scorpion, Deathstalker Scorpion, and the Blue Scorpion to name a few. The toxins from these scorpions contain promising chemotherapeutic potentials, according to several scientist. Seattle researchers used the venom from DeathStalker Scorpion to develop a product called Tumor Paint. This is a significant breakthrough, as the Tumor Paint is making it possible for surgeons to identify cancerous tissue when surgery is taking place. Using laser light, the cancer cells become fluorescent, enabling surgeons to see and remove the malignant tumor from healthy tissue with ease. This product was approved by the FDA to be used in clinical trials for patients with brain tumors. Scorpion venom has not been researched in humans in the cancer setting. Although there are numerous claims from companies selling this product, their claims are based on patient testimonials and unpublished questionable research. The Cuban government, where most claims of cancer being cured come from, has banned the use of scorpion venom brand Escozul in 2009 due to insufficient data. A homeopathic version of Escozul was then developed, but the solution is a very dilute version of the original product, and most likely does not have the same effect. 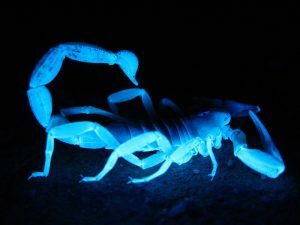 Scorpion venom is currently being studied in the laboratory setting and one day the right compound may be isolated from it and properly developed to create cancer therapies. Most recently, scientist Dipanjan Pan, who has been heavily invested in the scorpion venom as a source of cure, has developed a venom toxin called TsAP-1 from scorpions. This drug is called Nano Venin, and is reportedly 10 times more effective than other drugs in the treatment of breast cancer cells. Pan and his team have been able to treat melanoma and breast cancer cells in the lab, using the tiny sized particles that are hidden from the immune system, enabling them to target the cancer cells directly without affecting normal tissues. Pana��s team has shown tremendous progress and the next level of treatment in rats and pigs will be the major breakthrough, if the trials are successful. Scorpion venom has shown some success in people with cancer, with nearly 90% of 8300 people using it experiencing improvement in their quality of life, such as pain relief, increased muscle strength, and renewed energy. The improvement of quality of life, however, was not related to the cancer improving, as in most cases the cancer did not improve. For decades scientists have been in the search for a cure for cancer, and they have tried various avenues to come up with a promising drug. Unfortunately, there is still not a concrete cure resulting from their search or scorpion venom for cancer. The medical field has a long way to go, but looking at the progress that is happening, within the next 5 to 10 years, there may be a cancer treatment drug that can change the medical field forever.A� And it may even come from scorpion venom.